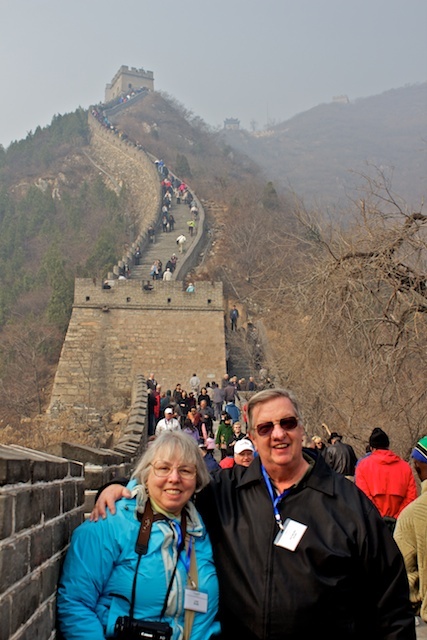 We had a nice buffet breakfast at the hotel this morning, then boarded the bus at 8am for the drive to the Great Wall. The spot along the wall that we went to was really beautiful. Too bad the smog marred the view. The bus took us quite a ways up the mountain to where only 3 towers were above us. I made it just beyond the first one and Ray was able to climb the stairs to the second. 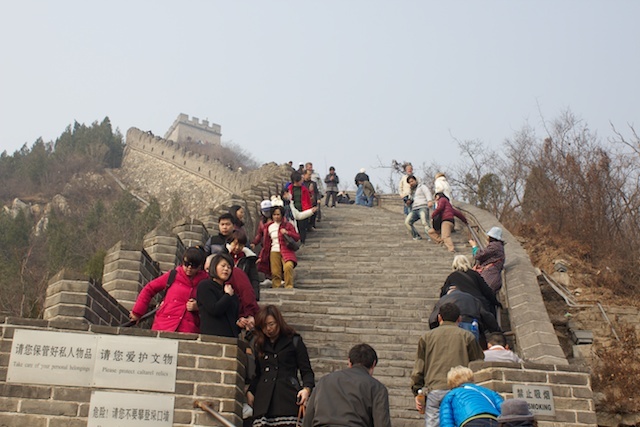 As you can see from the photos, there is a long steep stairway to the top. If the stairs were even it wouldn't have been too bad, Each of the stone steps was a different height and they are well worn by feet, wind and rain, so they are all different angles as well. I was proud to have made it as far as I did. Our buses took us to lunch at a different restaurant today. Did I mention that there are 9 buses of Regent passengers on this post-cruise tour package? That's about 300 people. We take over each restaurant we go to. Today's lunch was served in the same way as yesterday, but the dishes served were each a little different and, in my opinion, better than yesterday's. After lunch we went to the Ming Tombs. 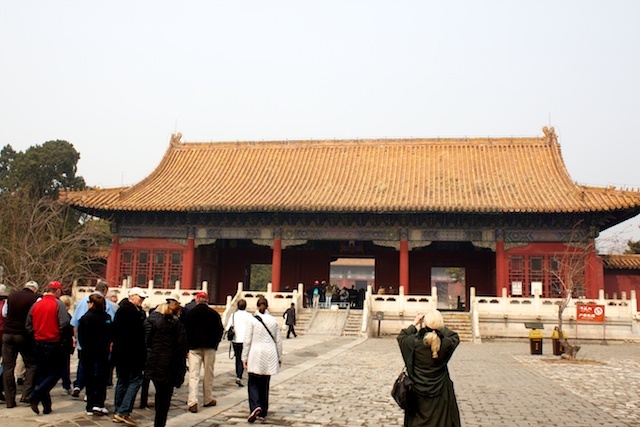 This is a very large area where the Ming Dynasty emperors were buried. These are very large and are miles apart, so there was only time for one. We only visited the oldest tomb complex, the Changling Tomb. which takes up about 120,000 sq. meters. This one was the mausoleum of Chengzu, the third emperor of the Ming Dynasty, who died in 1424. His empress, Xushi is also buried here. There are 3 main structures above ground and the actual mausoleum is at the back underground. The largest, center building is now a museum. As you walk in there is a bronze statue of the emperor in the center. 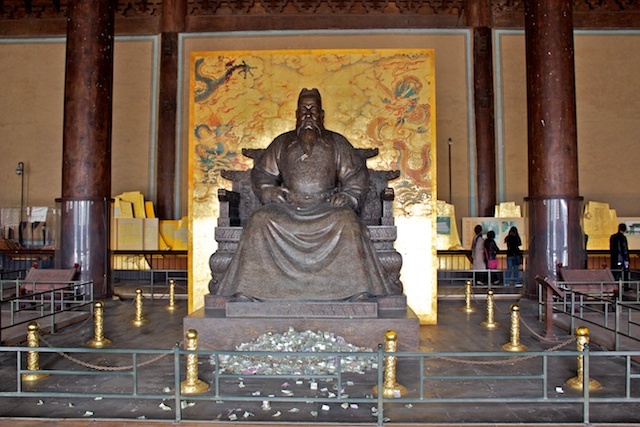 Chinese people view the emperors as gods, so they often throw money offerings at the statue. There is a large pile of bills at the foot of the statue. Among the other artifacts in the museum are 3 of particular note. One is the emperors crown - a cap woven from threads of solid gold. The second is the empress' crown, which is made from pearls and blue bird feathers. The third is a display of Ming vases, one of which is the distinctive blue pattern. This was another day with a lot of walking and we were tired, but we had one more event on the schedule. After a 2 hour rest at the hotel, we went out to dinner with the entire group, at what is supposed to be the best Peking Duck restaurant in Beijing. There were photos on the wall showing various world leaders dining there. We had another great meal and learned the proper way to eat Peking Duck. The meal even finished with Duck Soup. Now for a good night's sleep before our last full day of sightseeing tomorrow.